“Flying Fuzz” is a modern modification of legendary VOX Tone Bender, Marshall Supa Fuzz, and similar schemes 60-70s. This fuzz is based on three PNP germanium NOS (new old stock) transistors. "Flying Fuzzz" have an extra switch FAT, making the sound more greasy and dense. Another feature of the circuit is temperature stability (in contrast to Fuzz Face). If your idols Jimmy Page and Jeff Beck, then this is your fuzz! Power: 9V battery, or 9 volt negative center pin power supply *. All pedals are made individually. 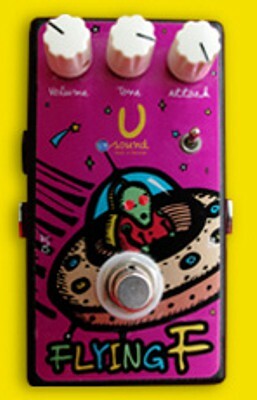 "Flying Fuzz" will ship within 3-4 business days of receiving cleared payment.